Wet Suits, Buoyancy Aids, Life Jackets, Rash Vests and kags. General Marine Items And Equipment. Outboard Motor Spares and Outboards. 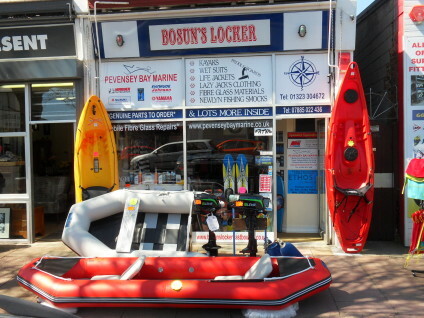 We are the only Boating and Marine Equipment Suppliers in Eastbourne and surrounding area. The owner has been in the Marine trade for over 35 years building and repairing boats and off-shore power boat racing with Honda for 4 years. He also has over 6 years of past Service with Eastbourne CoastGuard and the Cliff Team. Come and see us for a multi item one off deal on our retail prices, save ££££ and get on the water for less ! If We dont stock it We will try and get it for you with refundable deposit if we cant, deposit non refundable if you change your mind when we have. We may be able to give you free delivery in the local Eastbourne area for large items so please ask a member of staff at the time of purchase if you require this service. Our stock will change as you tell us what you would like us to sell so please be patient with us while we try and accommodate your requirements, Thank you. See the shop news and offers page for the latest Deals ! All major cards accepted in store. BOSUNS LOCKER EASTBOURNE SUPPORT THE RNLI AND THE COASTGUARD ASSOCIATION.